China Silk Road - HISTORY'S HISTORIESYou are history. We are the future. 2. Beliefs: ﻿Why do people live th﻿e way they do? The Silk Road: The Silk Road was not actually a road. Nor was it made of silk. It wasn't even paved, and it was not a single route. Instead, the Silk Road is a name that has been given to describe the interwoven travel passages, caravan routes, byways and, later, sea routes that stretched from China to the eastern Mediterranean. The Silk Road is best known for connecting China and Rome. However, it also had important branches that led to India and even northern Africa. At one end of the Silk Road was China. At the other end was Rome. Each had something the other wanted. Rome had gold and silver and precious gems. China had silk and spices and ivory. The trip was more than 4000 miles long. Few merchants, however, made the entire journey. Instead, trading happened in small villages along the route where, in relay fashion, goods exchanged hands several times along the way. As the painted silks above show, trade goods were not the only things travelers carried with them. Over time, artistic methods and motifs, styles of music, religions, languages, literature, philosophies and political ideologies were all transported along with the silks, spices, and porcelains that made the trip. Rather than the luxury items that passed from one set of hands to another, it was more often these cultural products that left a lasting impression. Why was the Silk Road created? During the Han Dynasty, China nearly doubled the amount of territory it controlled. One of the results was increased interaction with other cultures. China Expands: You'll remember that Emperor Qin Shi Huang di united China by defeating one warring feudal clan after another. Once in charge, he practiced legalist principles to maintain his rule. As a legalist, he forcefully put down any disagreement and quickly earned the wrath of the Chinese people. After the harsh rule of the Qin dynasty, the Hans instituted a more open form of rule based on Confucian principles. Han emperors were interested in education and exploration. Under the rule of the powerful Han emperor Wu di, China began to once again expand its empire. In 139 BCE, Wu di sent out one of his generals, Zhang Qian, to explore other nations. 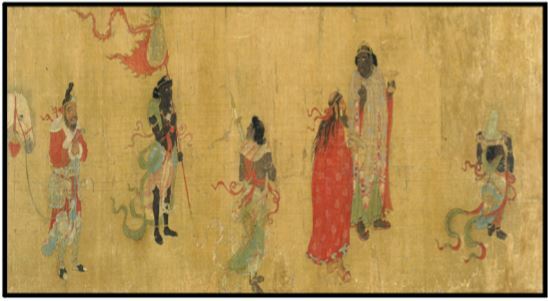 Zhang Qian and his army marched throughout distant regions, visiting other civilizations and nomadic tribes. After 13 years, Zhang Qian returned to his Emperor and told Wu di the stories he had heard of a great civilization to the West that equaled the glory of China. This was the first time Wu di had heard anything about any other advanced civilizations. 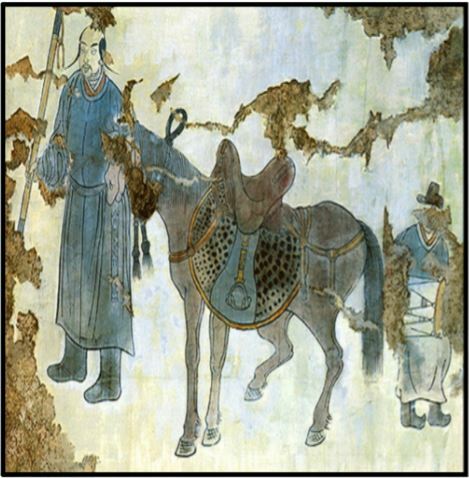 Zhang Qian also told his emperor of the great "blood sweating" horses he had seen in Central Asia. 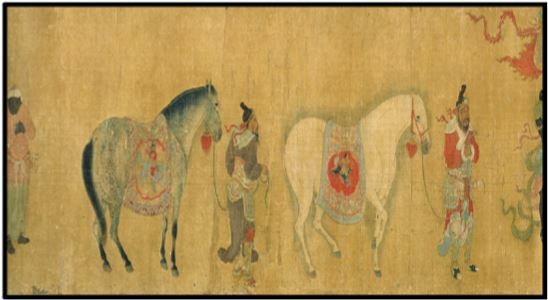 While it was later discovered that the "blood sweating" was due to a parasite that attacked the horse's flesh, Wu di thought that the horses were blessed by heaven and believed that owning them would multiply his power. As a result of Zhang Qian's discoveries, Wu di, who was a smart and wise ruler, for the first time oversaw an increase in trade between distant cultures and opened China's borders to the rest of the world. Brain Box: Why is the exchange of ideas important? The Roman Connection: The Romans were not surprised to find another civilization hidden beyond the mountains. In fact, they had been looking for “the Silk People” for a long time. From the peoples they conquered, they had discovered pieces of silk, and silk quickly became popular in Rome. The Romans, however, did not know who was making this wonderful material. The people they conquered did not know who was making silk either. They simply traded for it. Along its many paths, the Silk Road linked peoples of different cultures, religions, and ways of doing things. CLICK above to watch a video and find out more about the Silk Road. Due to the demand at home, the Romans sent out people to find the makers of silk, but they never did. Most never even returned. When the Eagle (sign of Rome) finally met the Dragon (sign of China), the Romans named China "Serica" after the Latin word that refers to silk. The Roman historian, Pliny the elder, wrote that Serica began just past the Tian Shan mountains in the western Chinese province of Xianjiang. Xianjiang literally means "distant lands." From about the fourth century BCE, the Greeks and Romans began talking of Serica, the Kingdom of Silk. Some historians believe the first Romans to set eyes upon the fabulous fabric were the legions of Marcus Licinius Crassus, Rome's appointed governor of Syria. At the battle of Carrhae near the Euphrates River in 53 BCE, the Roman soldiers were so startled by the bright silken banners of the Parthian troops that they fled in panic. Within decades, Chinese silks were widely worn by the rich and noble families of Rome. By the late Han Dynasty, the Roman Emperor wore nothing but silk. And, by the late 4th century CE, the Roman historian, Marcellinus Ammianus reported, "The use of silk, which was once confined to the nobility, has now spread to all classes without distinction, even to the lowest classes." Chinese women working in silk production. Over the centuries, Roman cravings for silk continued to increase. The price of Chinese silk continued to rise as well. The best Chinese silk cost as much as a Roman soldier's salary for an entire year! During this time, the Roman demand for imported silks was so great that it was feared silk would damage the Roman economy. The silk trade drained so much money from the Roman treasury that the Roman Emperor, Tiberius, complained that "ladies and their baubles are transferring our money to foreigners." In one year, Rome reportedly paid 22,000 pounds of gold for silk shipments. On economic and moral grounds, the Roman Senate issued several proclamations to prohibit the wearing of silk and declared the wearing of silk to be immoral. All of their edicts, however, were in vain and demand for silk continued to grow. The rewards for trading along the Silk road were great, but the dangers were many. If you chose to travel the Silk road, you faced desolate, white-hot sand dunes in the desert, forbidding mountains, brutal winds, and poisonous snakes. And, of course, there were always bandits and pirates. Very few traders made the whole trip. Travel was difficult and mishaps could rob a trader of their profits. Instead, traders worked in relays. Each trader would go a certain distance, exchange their goods for other goods, and hopefully return. The next would move along the road, trade, and hopefully return. The Silk Road had three main routes, and all were dangerous. Brain Box: Why was it rare for a trader to travel the length of the Silk Road? From China, traders set off with rice, silk brocade, tea, pasta, porcelain, and zhicheng (fabrics that are woven into specific shapes - like shoes). The Northern Silk Route led westward to the Black Sea. Traders along that route traded for copper, gold, silver, jade, and amber. The Central Silk Route led westward to Persia, the Mediterranean Sea, & Rome. Traders here sought glass, red carnelian & lapis lazuli, olive oil, tin, Greek and Roman pottery, Arabian war horses, and wool-felted garments, as well as the teachings of Christ and of Moses. The Southern Silk Route led westward to Iran, & India. Traders along this route sought prizes such as Indian spices and encountered the teachings of the Buddha. The Silk Road took caravans to the farthest extent of the Han Empire and, over the centuries, linked Eastern and Western cultures through exchanges in technology, the arts, and ideas. Over the centuries, the Silk Road developed a civilization of its own. Where possible, the Silk Road became lined with huge temples and booming cities. There were, however, still the deserts and the mountains. It was never easy to travel the Silk Road. Footsteps of Marco Polo from Bilski Productions on Vimeo.